Kevin Lee (pictured) talks a good game, but the lightweight better save all of his energy after barely making weight for UFC 216. 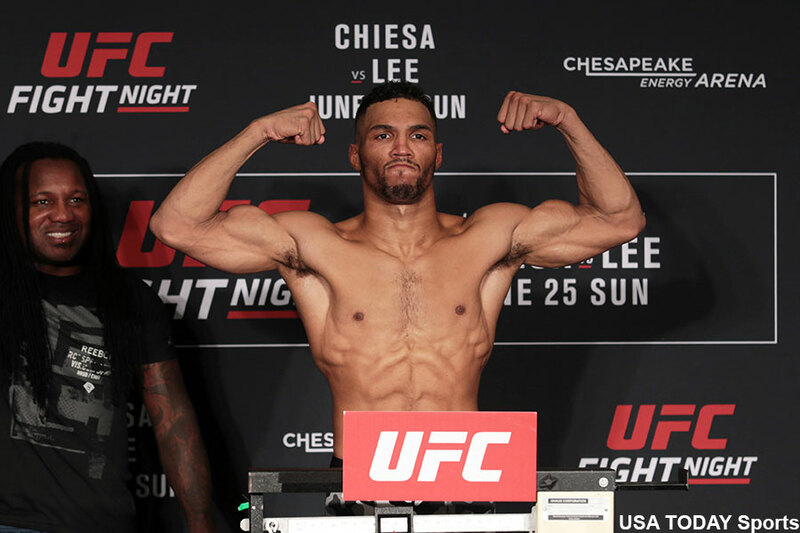 Lee initially weighed in at 156 pounds for his vacant interim lightweight title fight against Tony Ferguson, which is one pound over the limit for a championship affair. Typically, that would have immediately changed the dynamic of Saturday night’s main event. However, Lee was granted an additional hour to make the 155 pound max. Lee managed to cut the excess weight and clocked 154.5 pounds on the scale with just minutes remaining in the early (official) weigh-ins. You can stream the ceremonial weigh-ins below starting live at 8PM ET/5PM PT. ESPN.com’s Brett Okomoto asked Nevada Athletic Commission director Bob Bennett, who was overseeing Friday’s weigh-ins, why Lee was afforded the extra time to make weight when other fighters weren’t in the past. Bennett said to ask the UFC. Interesting… And concerning for multiple reasons. Why is there gray area when it comes to additional time – either fighters are granted it or they’re not, period. More importantly, someone better do something about these drastic weight cuts the fighters are putting their bodies through before more people die. Brooks made weight at 156. It is unknown if he will still receive his show money. Back to Lee, he was seen backstage leaning heavily on his coaches to assist him in walking. It will be interesting to see how his body responds to a five round title fight in about 31 hours. T-Mobile Arena in Las Vegas hosts Saturday’s show.